As a kid growing up in Barcelona, Spain; the Mediterranean Sea was Víctor’s playground. Spending hours snorkeling in the northwestern Mediterranean, he quickly developed an appreciation for the marine environment. After earning his undergraduate degree in Spain, he moved overseas and spent five years in the western Caribbean, where he combined field research with conservation activities. In 2016, he completed his Master’s Degree in Marine Biology and Ecology at James Cook University. In his MSc thesis, supervised by Prof. Bellwood, Víctor described an unusual lip adaptation in tubelip wrasses that enables them to feed on corals. 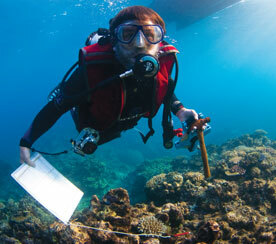 In his PhD, he is investigating the effects of coral-feeding fishes on coral reef resilience.